Broadway Ballroom - Learn How To Dance! Learn how to dance and have more fun at the next wedding or social function you attend! At Broadway Ballroom our one hour private lessons are 55 minutes long with 5 minutes at the end to schedule your next appointment and get ready for the next student. The national chain studios only offer a 45 or 50 minute lesson at a higher price. We listen to the students and teach them exactly what they want to learn. 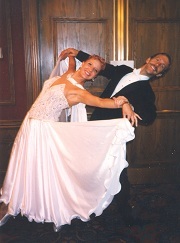 At Broadway Ballroom, you are not forced to learn dances you are not interested in or pressured into competitions. The student sets the pace for how quickly or slowly they want to learn.